The Design Automation Lab is a research group at the Department of Architecture, National University of Singapore. The lab was set up by Patrick Janssen in 2008. The lab conducts research into the development of computational method and tools for supporting design decision making at building and urban scales. These methods and tools support an adaptive-iterative type of design process that consists of two nested loops, as shown in the figure below. 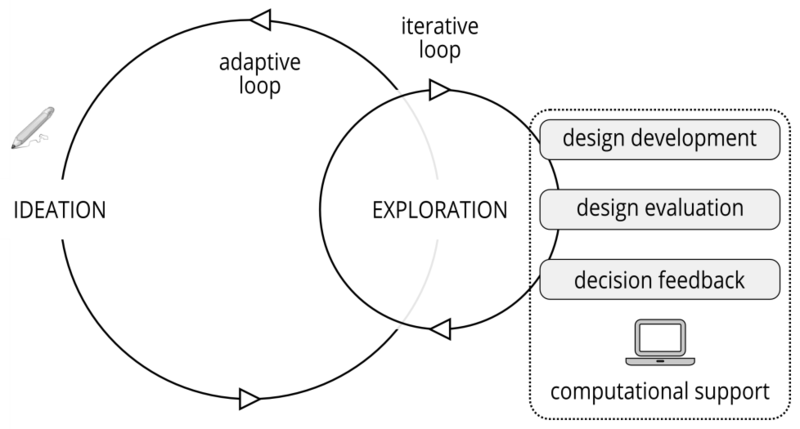 In the adaptive loop, design concepts and ideas are developed. In the iterative loop, the workability of these concepts and ideas are explored in three steps. First, design variants are developed based on the schema. Second, the variants are evaluated with respect to certain criteria. Third, feedback is generated based on the evaluation. The research focuses mainly on the inner loop. It aims to support design decision making by creating computational procedures that automate steps in this inner loop in various combinations.